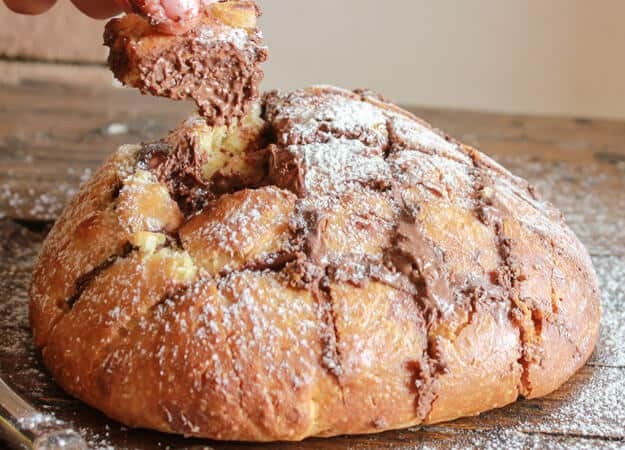 Easy Homemade Brioche Nutella Pull Apart Bread a delicious sweet Homemade Brioche Bread, baked and then stuffed with Nutella and rebaked. 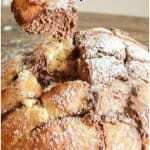 Eat this amazing Nutella Pull Apart Bread warm out of the oven as a yummy snack or dessert. Amazing! Ever since I first saw this Pull Apart/Crack Bread on the internet I was quite intrigued by it. I noticed it was almost always made with cheese, or on occasion, a Cinnamon Dessert bread. Both have made my mouth water. 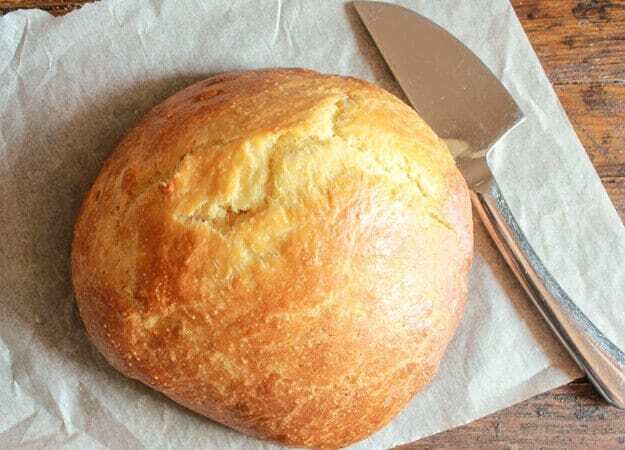 When making the cheesy pull apart bread, a sour dough bread is usually used. I knew this wasn’t what I was looking for. I decided instead to opt for a slightly sweet but compact bread. Nothing better than a Brioche. This Brioche has a little bit of an Italian influence ( thanks to a recipe from my mother-in-law), because it has a tighter crumb. 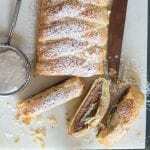 Just what I was looking for, for this yummy Nutella Pull Apart Bread. 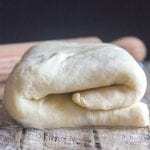 It is a really easy bread to make, using a stand up mixer with the dough hook makes it fast and painless. 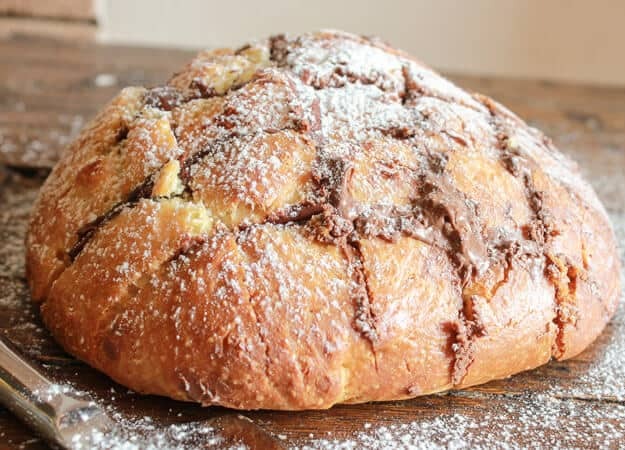 I actually divided the dough in two and one loaf I left plain, (makes a delicious sandwich bread) and the other I used for this Easy Homemade Brioche Nutella Pull Apart Bread. After I let the Brioche cool, I sliced it (not all the way through) spread on the Nutella, turned it 90°, sliced it again and spread it with more Nutella. I then wrapped it in foil and baked it for 10 minutes. I let it cool slightly and dusted it with powdered sugar. And then everyone went for it! Enjoy! 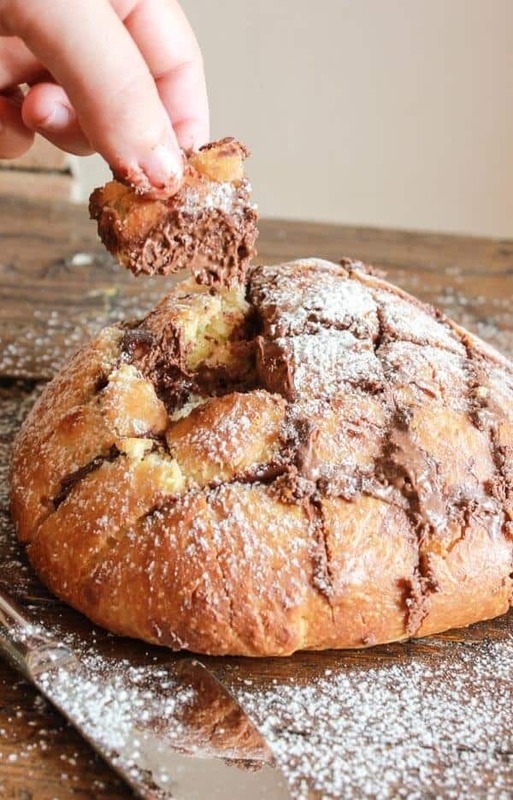 Easy Homemade Brioche Nutella Pull Apart Bread, a delicious not too sweet, Pull Apart Bread, a Nutella Dessert lovers dream! In the bowl of the stand up mixer add flour and butter, combine with a fork to form a crumbly mixture, using a wooden spoon stir in sugar, yeast and salt. Attach bread hook to mixer, add eggs and combine on low to form a soft dough, continue mixing on low - medium for approximately 5 minutes. 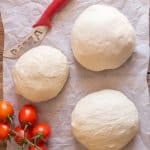 Remove dough (will be sticky) to a lightly floured flat surface and knead gently for a minute, form into a ball and place in a large bowl, cover with plastic wrap and let rise until doubled in size in a warm draft free area for 2 hours. 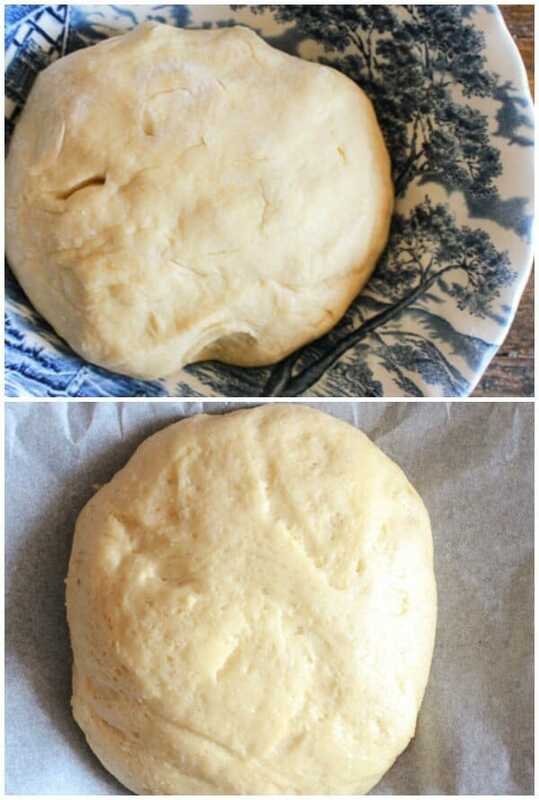 Remove dough to a lightly floured flat surface knead gently a few times, divide in two (I made 1 loaf plain and 1 loaf Nutella pull apart) balls, place on parchment paper lined cookie sheet, cover in plastic and let rise 1 hour. Brush top of loaf/loafs lightly with milk, bake for 20-25 minutes or until golden, (tap the bottom of the loaf it should sound hollow when done). Remove to wire rack to cool completely. Cut the loaf lengthwise into 1/2 inch (1 1/4 centimeters) slices, do not cut through to the bottom crust. In between the slices spread with 1/2 the Nutella, turn the loaf 90° and slice 1/2 pieces again, spread with the rest of the Nutella. Wrap in foil and bake in pre-heated oven for 10 minutes. 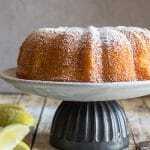 Let cool slightly, dust with powdered sugar and serve. Enjoy! Can this be filled with a thick strawberry jam? Or anything else other than Nutella? Hi Judy, I think it would be fine with a thick jam or even a pie filling. Let me know how it turns out. Thanks so much for your reply, I appreciate it. Loving this bread, looks so yummy! Thanks for stopping by #TryaBiteTuesday – hope to see you back this week, pinning & sharing! This is a beautiful bread! Thank you so much for linking up at Tasty Tuesday! This post has been pinned on the Tasty Tuesday Pinterest board! I love having you and can’t wait to see you next week! I have seen plenty of the pull apart breads, but this one looks the best. Nutella? I’m there! Thanks for linking up at the Bloggers Brags party, I pinned your post to our group board. Hi Ali, thanks very much. Have a great day. This looks so good! I have a weakness for both bread and nutella so this is kind of dangerous for me 😀 lol that’s okay! 🙂 This is the first time I am visiting your blog (via Weekend Retreat Link Party). Glad I stopped by! Hi Angeline, glad you stopped by and hope you enjoy it. Have a great day. Wow. That looks amazing! I want some right now! Thank you for linking up at the #HomeMattersParty this week. Hope to see you back next week. Rosemary, what a wonderful and decadent idea! The bread recipe sounds great by itself and nutella is delicious. Together I love it! Thanks Linda, yes Nutella can be decadent! But loved by all. Have a great day. Just like the name says! I can’t stop eating it! Brioche is always so tricky for me, but you’ve made it look and sound easy. I’m going to try again – even though you had me at “Nutella”! Hi Tracy, thanks, actually it was pretty easy, let me know how it goes. That looks absolutely incredible, plus it’s Nutella. I’d eat that with anything. Or just by the jar on its own 🙂 Must try this. Thanks. Hi Leo, thanks hope you enjoy it! Anything with nutella has to be good. I also like the idea of baking a plain loaf. This recipe is a win/win. Thank you Rosemary. Have a nice weekend. When I saw the Nutella in the title I thought the Nutella family nut had asked for her Nutella again 🙂 It sounds delicious, Rosemary. I can also see this as a breakfast addition — yummy! Thank you for sharing! !